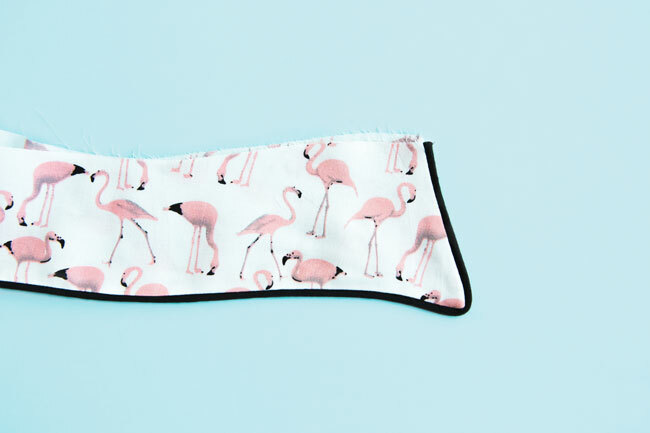 Stitching piping to the seams of your handmade clothes is a lovely way to highlight interesting style lines, particularly if they’d otherwise be hidden by a darker fabric or busy print. 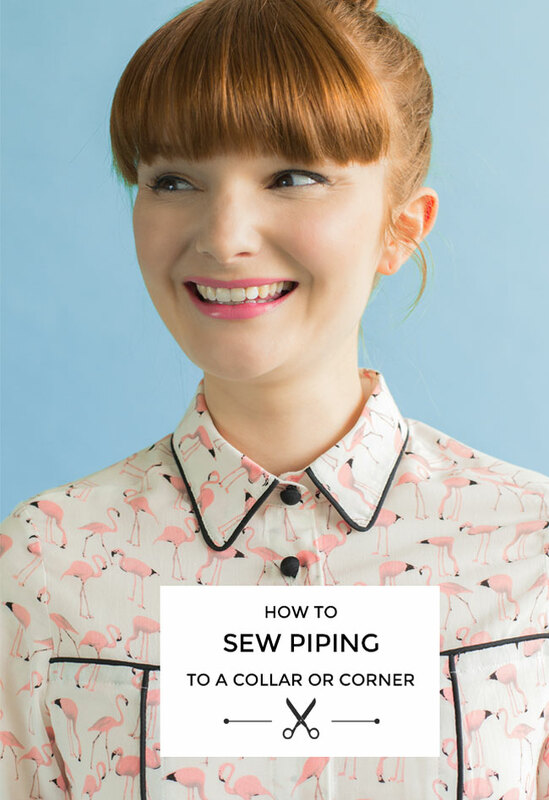 While I’ve written about piping before, I expect some of you may be wondering how to pipe the corners on the Rosa shirt and dress – on the pointed yoke and corners of the collar. So today I’m going to take you through the steps to pipe a seam with a corner. You can buy ready-made piping, or you can make your own by cutting a strip of fabric on the bias (ie. at a 45 degree angle to the selvedges), wrapping it around some piping cord and sewing it in place. You’ll also need a piping foot or adjustable zip foot for your sewing machine (check it fits the model of sewing machine you have). 1) Cut the piping so it’s a little longer than the seam you want to sew it to. On the Rosa shirt, this will be the edge of the collar, the yoke seam on the yokes, and/or the princess seams. 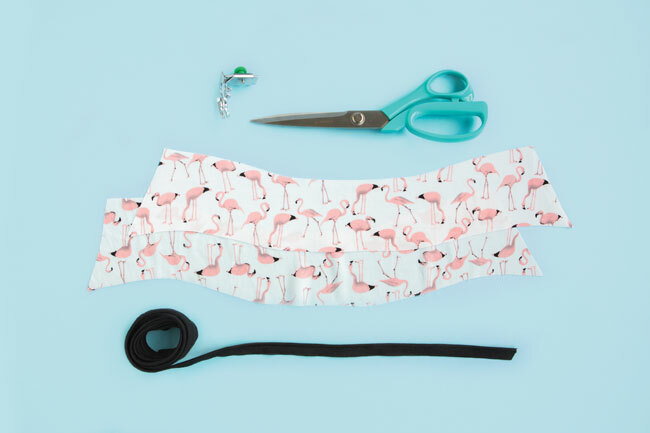 Our patterns include a 15mm (5/8in) seam allowance – if the seam allowance on the piping (the flat fabric part without any cord inside) is narrower than this, you may find it helpful to trim the seam allowances on the fabric down. So, for example, if the piping seam allowance is 10mm (3/8in), trim 5mm (1/4in) off the fabric. 2) Start pinning the piping to the right side of one of the seams (ie. the side that will show on the outside of your garment), with the cord running along the stitching line. Line up the raw edge of the piping with the raw edge of the fabric. If you didn’t trim the fabric, make sure the line between the cord and the piping seam allowances is lined up with the seam line - 15mm or 5/8in inside the raw edge of the fabric. 3) Once you’ve pinned one side of the collar or yoke, clip into the piping seam allowance at the exact point where it will join the corner. 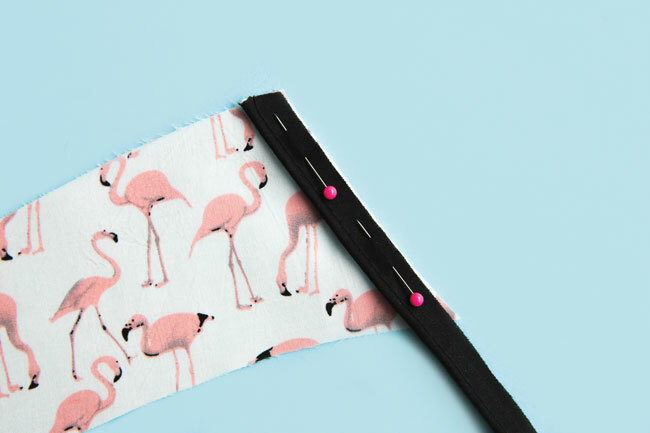 This will allow the seam allowance to open up – you can now bend it around the corner and pin it to the rest of the edge. 4) Attach a piping foot or adjustable zip foot to your sewing machine, positioning it so the needle is right next to the edge. You can use a regular zip foot if you don’t have a piping or adjustable zip one, but I find the latter much easier to use. 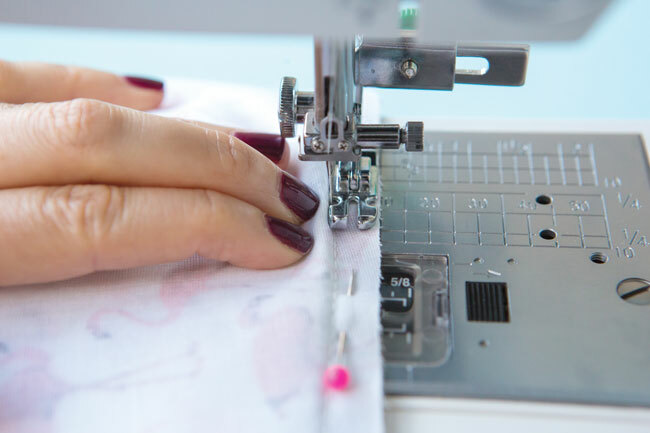 Set your machine to a longer stitch length (4-5mm) and tack (baste) the fabric part of the piping to the garment within the seam allowance, on one edge of the collar at a time. 5) Re-snip any notches on the fabric edges that have been hidden by the piping. Pin the fabric pieces together as normal, with the piping sandwiched between them. 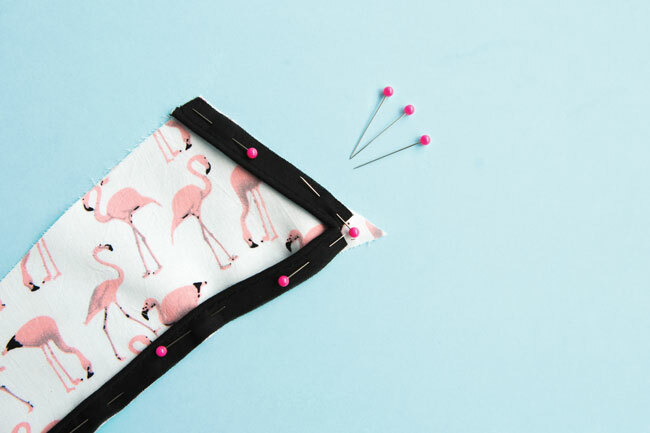 Using the piping foot or adjustable zip foot, stitch the seams together – the key is to get the needle as close as you can get to the piping cord without sewing over it. Like, really close. 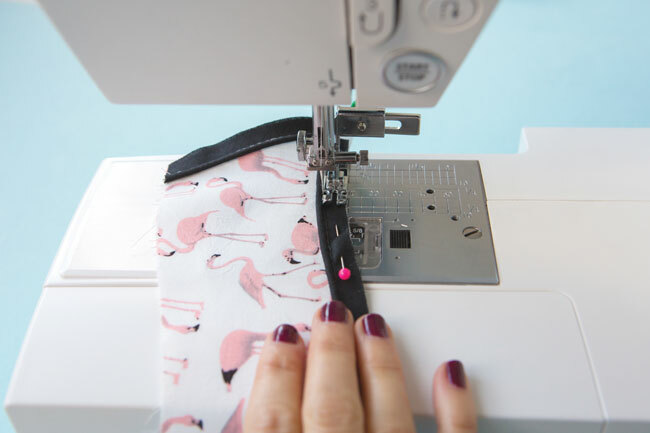 This is where the piping or adjustable zip foot comes in handy because the foot is really narrow and doesn't get in the way of the needle – push the piping cord right up against the edge of the presser foot as you sew. Turn the seam right sides out and check that the tacking and piping tape aren’t visible. If your first attempt of stitching wasn’t quite close enough to the piping cord, no worries – just turn it back wrong sides out try stitching another line even closer. (You don’t need to unpick the previous attempt – it will be hidden in the seam allowance – yesss!). Bear in mind that bending the piping around a corner will mean it won’t turn out as sharp as it would have without the cord – but it’ll still look awesome! Continue the rest of your sewing project as normal. And feel super smug with your gorgeous piped seams! PS. Want some more help sewing your Rosa shirt? 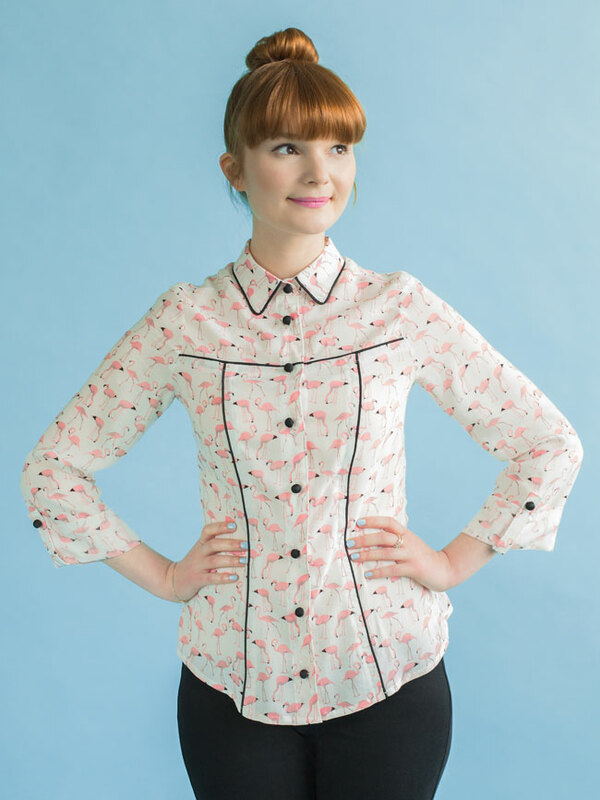 Sign up to our online workshop, Sew Your Own Shirt or Shirt Dress!